West Australians are different. They live in one of the most remote corners of the planet. Their capital, Perth, has a reputation for being the most isolated city in the world. It is 41 hours from Sydney by car, much of it across the barren and unrelenting desert of the Nullabor Plain, 4 hours by aeroplane, 184 hours by bicycle and, for anyone crazy enough to walk, 741 hours on foot. Even Adelaide, the nearest city of more than a million people is a colossal 2,691 km away. Travel to Western Australia ('W.A') from anywhere on earth and you will have undertaken an epic journey before you even get there. That is why I love it! The thing which hits you about W.A is how vast it is. If it was an independent country it would be in the top ten largest countries in the world and at 2,600,000 square kilometres it is the second largest county subdivision on the planet, way ahead of Alaska and Texas. Western Australia gives new meaning to the term 'outback'. Much of the state is inaccessible to the average tourist and those parts which can be reached require lots of planning and preparation. Four wheel drives (SUVs) are essential anywhere even slightly off the beaten track, as is a rudimentary knowledge of how to fix things if you break down. But don't despair! If, like David and I, you don't want to see the state on an organised tour and your knowledge of fixing cars stops at changing a tyre (actually I don't think I even know how to do that), there is a quiet little corner of W.A which is relatively populated and easy to travel in. I am talking about the south-west; from Perth around the coast to Esperance. Here you will find good roads, plenty of accommodation, friendly locals and beautiful scenery - perfect for a safe easy road trip. 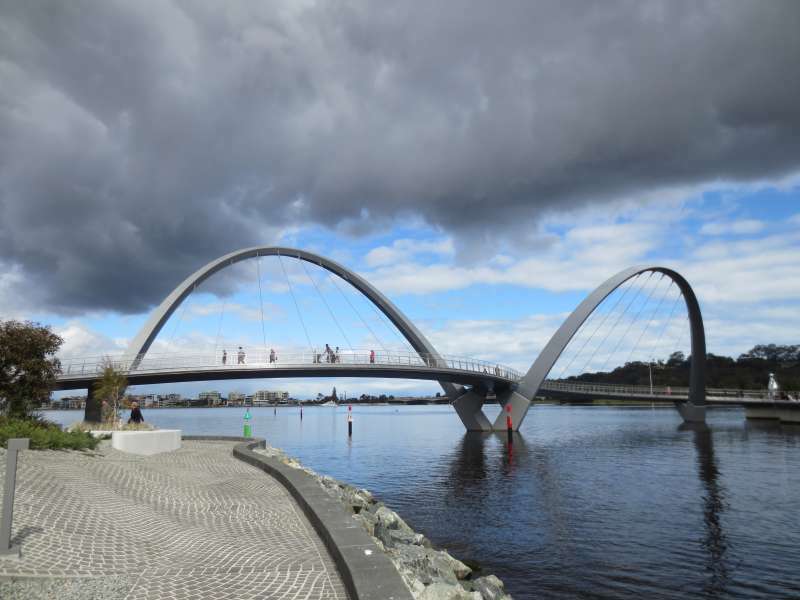 With a population of just over two million people, Perth is small enough to be easy to visit and large enough to have lots of things to see and do. There is a good range of international hotels within easy walking distance of most of the city sights. Driving and parking is hassle free and the public transport network is easy to use. Kings Park, the largest city park in the world. Visit during the wildlfower festival (September) if you can. 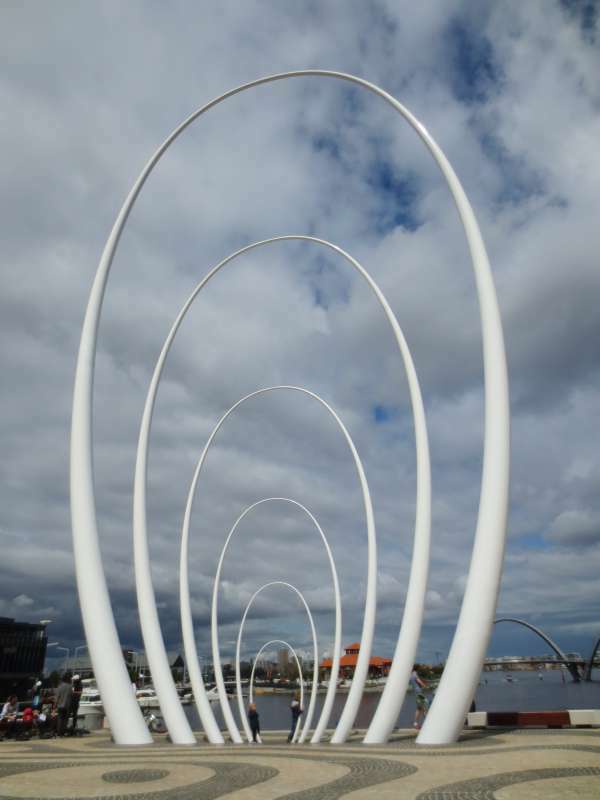 Elizabeth Quay Precinct, between Barrack St and William St in the city. This is cosmopolitan Perth at its most vibrant, with cafes, restaurants, and loads of interesting outdoor spaces. My favourite is Spanda a 29m tall sculpture which looks for all the world like a giant paperclip. Fremantle. Strictly speaking Fremantle is a separate city but it is right next to Perth and easy to get to either by road, train or river cruise. Click here for a photo tour of Fremantle by a friend and fellow blogger Rhonda, of Albom Adventures. Rottnest Island. If you are pushed for time, this is the sight I would miss. People seem to love it or hate it in equal measure. Click on the link for my impressions of the island. Spanda - aka the giant paperclip. Margaret River is 3 hours by car south of Perth. This is wine country, where the main attraction is sitting back and enjoying a slow, gourmet lunch with a nice glass of red. Last time David and I stayed at Margaret River we had lunch at Leeuwin Estate and it was one of the most enjoyable meals I have ever had. If the gnocchi is still on the menu, I can highly recommend it. 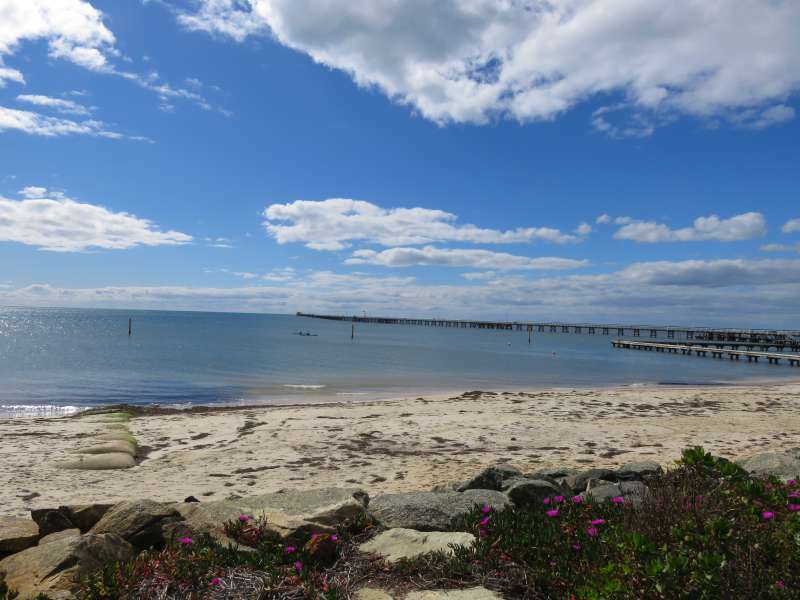 Call in at Busselton Jetty, the longest timber piled jetty in the southern hemisphere. The jetty has an underwater observatory 1.7 kms from the shore where visitors can see the coral and marine life of the jetty's artificial reef. Visibility varies according to weather conditions. Unfortunately the day we were there visibility was so poor we couldn't justify the fairly pricey cost. If you want to get an idea of what you can see click here for a live web-cam. Don't forget the time difference. If all you see is black, it may be the middle of the night in W.A. Watch out for whales. Between September and December migrating humpbacks can be seen in Geographe Bay. Take a tour from Busselton or head out to Cape Naturalist Lighthouse for a chance to spot them from shore. Explore the limestone caves and native forests a short drive from Margaret River. Civilisation doesn't quite stop at Albany but it certainly slows down. East of here you leave the more populated corner of the state and begin to appreciate just how empty Western Australia is. Even if it wasn't such a lovely town to spend a few nights in you would want to stop in Albany before making the final five hour push through to Esperance. Between Margaret River and Albany call in at the forests around Pemberton, Walpole and Denmark, home to some of the world's tallest trees. If you have a good head for heights you can even climb a few of these majestic giants. 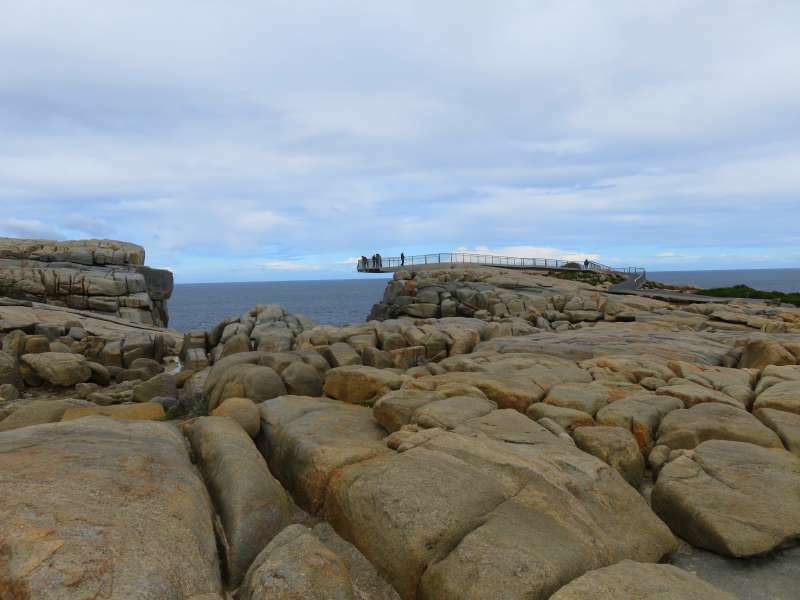 Visit the Gap, the Natural Bridge and the Blowholes at Torndirrup National Park and marvel at the power of the Great Southern Ocean. Visit the National ANZAC Centre and learn the story of the ANZACs many of whom saw Australia for the last time as their troop ships sailed away from Albany's harbour. Watch out for whales from June to October. If you are lucky you might see them from the shore. The best whale watching experience I have ever had was pure luck, just standing on the shore at Albany. Drive out along Frenchman Bay Road toward Vancouver Peninsula and look for kangaroos laying around in people's front gardens. 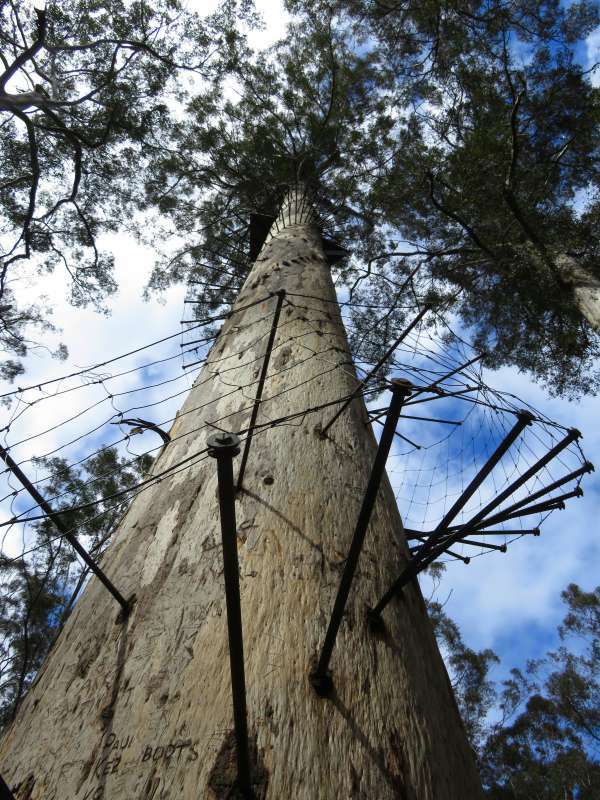 Dave Evans Bicentennial Tree - you can climb it if you are game! Esperance is the end of the line. The sealed road stops just east of the town at Cape Le Grand National Park. Esperance is famous for its pink lakes, sunbathing kangaroos and beautiful beaches. 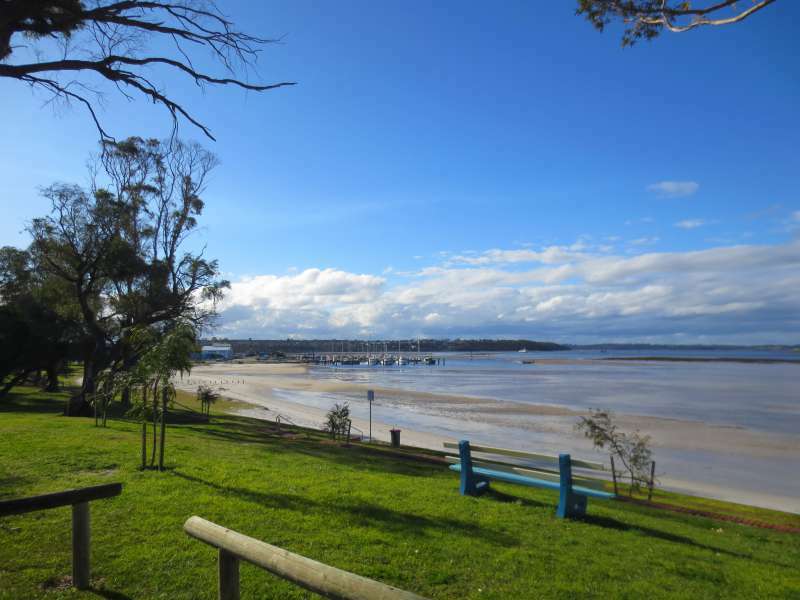 Unfortunately, the only easily accessible pink lake has not been pink for many years and the sunbathing kangaroos don't always co-operate, but the beaches are absolutely stunning and the town has a living on the edge of the world feel which makes it great fun to visit. Drive out to Lucky Bay in Cape Le Grand National Park. Lucky Bay is famous for its whiter than white sand and kangaroos who like to hang around on the beach. We didn't see any kangaroos when we were there but the beach and surrounds were well worth the drive out. Keep an eye out for wildflowers. Western Australia has 12,000 species of wildflowers over 60% of which are found nowhere else on the planet. We saw wildflowers by the side of the road during our whole south-west Australia road trip but nowhere were they as prolific as between Albany and Esperance. 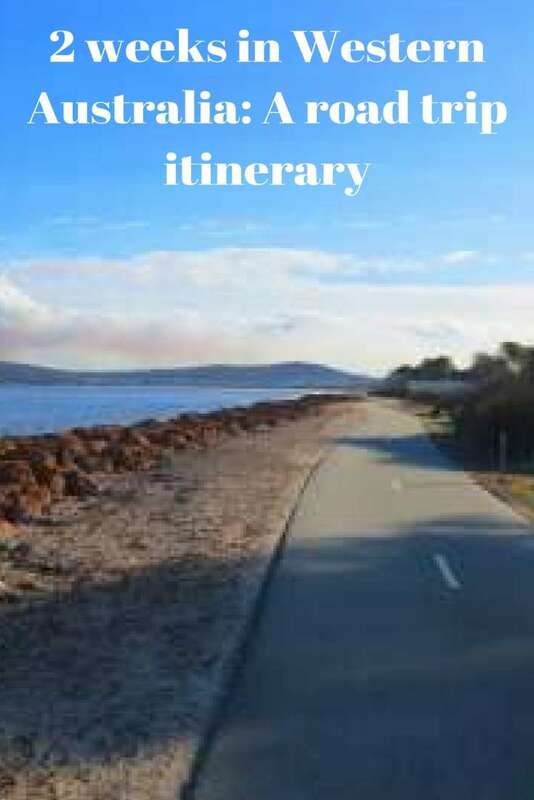 Walk or cycle the Great Ocean Way path from Esperance Bay to Twilight Beach for birds eye views of the most stunning beaches I have ever seen. Visit Stonehenge. This is a bit of a weird one but David and I loved it. 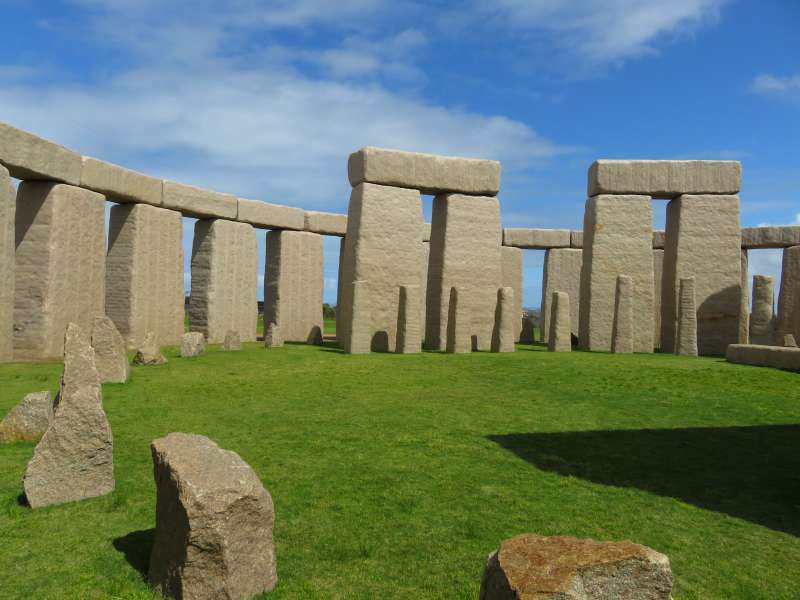 Esperance Stonehenge is a full sized granite replica of the famous neolithic monument. Unlike the real thing you can walk right up to it. For more about Esperance read my blog post - Esperance: Pink lakes and sunbathing kangaroos. 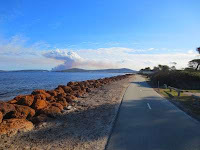 Esperance is 8 hours by car from Perth via state route 40. Almost exactly half way along is Wave Rock, a 15 m high, 110 m granite cliff shaped like a giant wave. The nearby town of Hyden is probably as good a place as any to stop for the night on your return trip. David and I drove back to Perth via Albany. David isn't a great fan of rock formations and I wasn't consulted until it was too late to change our accommodation reservations. As a result, I am no expert on either Wave Rock or Hyden. I can guess that Hyden's motels are likely to be fairly basic, but this is the outback after all and getting away from the luxuries of modern city life is all part of the experience. I couldn't finish this post without a photo of some of W.A's wildlife. Western Australia is a great place to see kangaroos and emus in the wild. 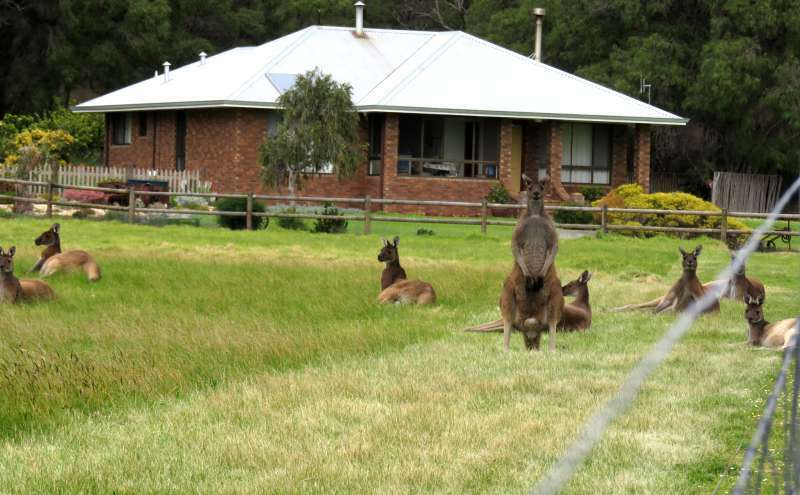 These kangaroos were just hanging around in someone's front yard on the outskirts of Albany. You don't need a tour to see the south-west corner of Western Australia. Just hire a car and pack your camera. However if you want to see what tours are available click here at Get Your Guide for a list. (Note: If you book a tour through this link we earn a small commission). 7 things to do in Amazing Albany. Thank you for taking the time to read my blog. I hope the information was of some use to you. Please say hello in the comments section. I love connecting with fellow travellers and would-be travellers. I try to publish a post every week. Usually Thursday or Friday, depending on your time zone. If you would like to follow our travels, check back each week or enter your email address in the 'Never miss a post: Follow by email' box in the right hand sidebar just below my profile picture. It is a great part of the world. You covered the part of Australia that I missed on my last trip. I wanted to do Perth Esperance but timing was not on my side. Busselton Jetty was on my list of things to see but I barely had enough time to see Perth CBD and Fremantle between my cruise disembarkation and my flight home. 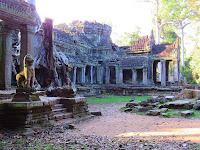 The south-west corner can get pretty chilly in winter and the north-west gets really hot in summer so it is difficult to see both in one visit. You'll just have to come back! We didn't get great weather in Busselton and so while we had a bit of a wander around we didn't see the underwater observatory - the water just wasn't clear enough. Watch this space. David and I are headed to the Kimberleys in June. The Kimberleys are the extreme outback. I have wanted to go there forever and I will have lots to write about. When you do come to Oz let me know. I would love to meet you and Corinne in person. Lyn this is a great insight into part of our beautiful state. Many people don't realise just how isolated we are here or just how large the state is. But I must admit that despite living here I've never made it to Esperance. You should go. I loved Esperance. It is about 15 on a 1-10 beautiful scale, although it is terribly sad about the young girl who has been in the news there in the last few days. My heart reaches out to her family. Thanks for the itinerary - I definitely wouldn't know where to start if I was traveling to Western Australia. Not a clue. So if I ever make it there, I'll at least have some info on where to go and what to do. If you ever do go I can put you in touch with a couple of West Australian bloggers I know who can give you 'on the ground' information. We have two more Western Australian trips planned for this year so I will be blogging about the state so much I'm sure everyone will get sick of it. Western Australia is like no other place on earth. What great itineraries! I've only done a small part of WA by road... Perth to Kalgoorlie in an RV. Was great to see those wildflowers and countryside but would love to do more. I once drove from Sydney to Perth and we went through Coolgardie but didn't turn off for Kalgoorlie. I think we were just too worn out to think of detouring even a small amount - lol. It was the middle of summer, in the days before cars had air-conditioning. It is on my list though. This looks like a great itinerary! I love the photos, the clouds really add to the beauty! Thanks for sharing on #TheWeeklyPostcard. The whole trip was stunning. Make sure you contact me if you ever plan a trip. I would love to help you with where to go and what to see. Haha - I thought the fake Stonehenge was great but then I love finding weird things in unexpected places. David and I are going back to Western Australia later this year, first to the Kimberleys and then to do a road trip up the coral coast north of Perth. Watch out for my posts! As for kangaroos in the front yard, it is more common in Australia than you might imagine. I live in Sydney and we are about to move to a suburb a bit further out where I have been told we will have wallabies and the occasional kangaroo visiting us all the time. I hope you get there - and good luck with the whales. They didn't co-operate on this last trip but I will never forget seeing them in the harbour at Albany many years ago. They were literally right below where I was standing on the cliff path. Man, I need to go to WA! It looks beautiful! That Stonehenge is weird haha, I went to a foam one in the USA (Virginia, I think?) and that was funny too! There is a granite (or some kind of stone - I am not really an expert on rocks) in Washington State. It just sits by the side of the road. It was built as a memorial to WW II. I have heard that there is one in New Zealand too. One day I am going to do a post on replica stonehenge's around the world. If you do plan to come to Oz, let me know. I would love to meet up in person. What a gorgeous road trip! You nailed the scenery Australia! Thanks. It was a great trip. Those are some pretty impressive stats about how far WA and Perth is from everywhere else in the country (at least the east coast). The Indian Ocean is exactly the same to swim in an any other ocean but I get what you mean by wanting to swim in it. The thing about Rottnest is that it is one of those 'if you never go you never know' kind of places. Even though I was a bit disappointed by the island I am really glad we saw it. As to Margaret River, if you are really loaded you can take a helicopter there from Perth for lunch at one of the wineries - lol! This area is on the exact opposite side of the world from where I live so, naturally, I want to go there. Thank you for providing a detailed look at western Australia. I want to visit! There is something very exotic about travelling to the opposite side of the world. I hope you get to W.A one day. I am sure you would love it. Haha - We occasionally get the same thing in the eastern states - tourists who think they can drive from Melbourne or Sydney to Cairns in a couple of days. It was hard in the days before Google maps to get a feel for how big Australia is but the ability to get an estimate of driving times from Google has made a big difference. I know it has saved our bacon a couple of times with mountain roads in Sth America. They look short on a map until you realise how long they take to drive. What scenic and unusual places you show us. Thanks for sharing. Oh yeah, we're Pinning this for later! That's a pretty daunting road trip, but what an itinerary. 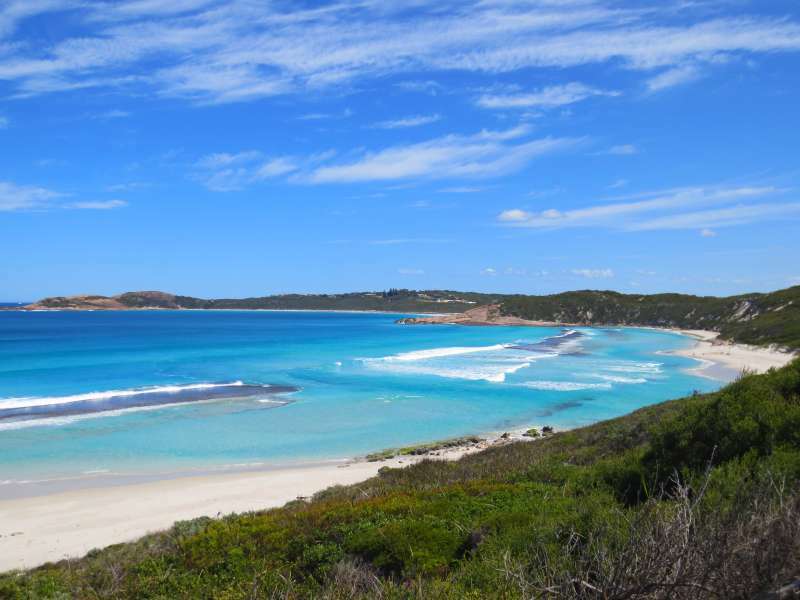 Great pictures, too - that beach in Esperance is gorgeous! Thanks for linking up with #TheWeeklyPostcard. The beaches at Esperance are among the most stunning beaches on the planet IMHO! On my one trip to Australia we didn't get to the western half of the country at all. You don't get a feel for how big it is until you plan a four-week trip and realize that in order to see much, you'll have to fly from place to place. We ended up seeing Cairns (only briefly), Townsville (to visit friends), Melbourne (but not Sydney! ), Adelaide (via the ocean road), Alice Springs (a week-long outback drive), Darwin (and Kakadu), and a three-day liveaboard diving on the Great Barrier Reef. Yet there was so much else we would have loved to see! I hope I can arrange another visit one day and see the west! It sounds to me as though you saw a huge amount in four weeks. It is a pity you missed Sydney and when you come back I can really recommend Western Australia. Get in touch if you ever come to Sydney. I've just returned from 2 weeks on Australia's east coast....looks like there's a lot to do on the west coast as well! Love the architectural sculptures -- the bridge and paper clip. The bridge and the paper clip are great aren't they. Maybe Perth is trying to compete with Sydney's Harbour Bridge and Opera House! You are so right about the distances. David and I love road trips and Western Australia is a great place for them. Later this year we are headed north from Perth along the Coral coast. What a great itinerary Lyn. Should we come to Western Australia I am going to be pulling this out and not spend weeks in the planning. Very helpful. David and I leave for the Kimberleys (the far north-west of Western Australia) in a couple of weeks and later in the year we are doing a road trip on the Coral Coast, north of Perth. Between my blog posts on all three areas, including this one on the south-west, I will have just about covered the state.